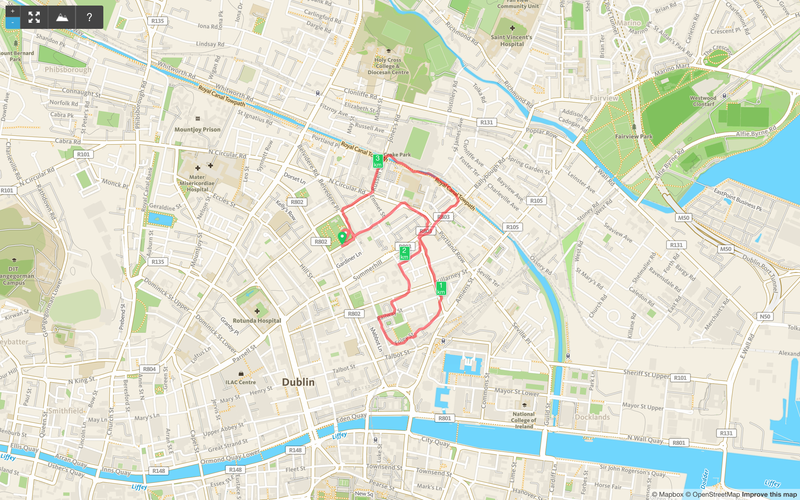 I went for a run around Nighttown, commonly known in Dublin parlance as Monto. The first thing I noticed is how much new buildings there are. Dublin was not extensively bombed during World War Two, known in Ireland as The Emergency, but most of the buildings in Nighttown have been replaced in the second half of the twentieth century as slums and tenements that feature strongly in the Circe episode in Ulysses were torn down. 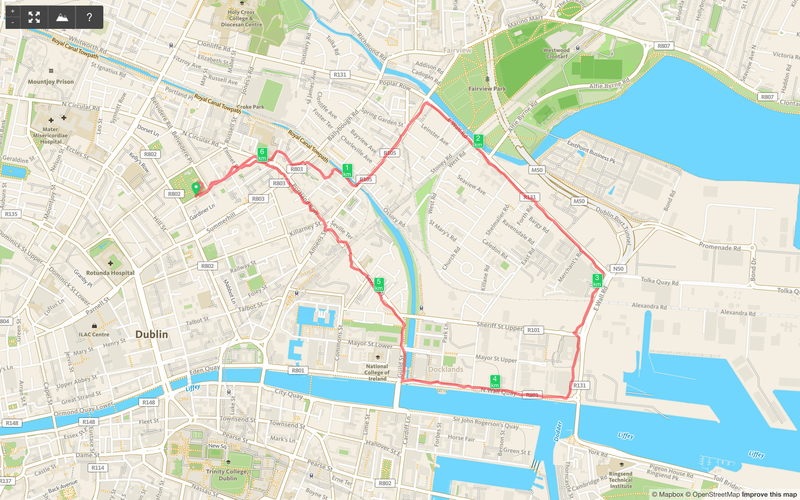 There have been distinct efforts to eliminate traces of Monto as whilst the street patterns largely remain the names have changed from Meklinburgh Street Lower to Lower Tyrone Street and then to Railway Street, Montgomery Street to Foley Street and Mabbot Street to Corporation Street, to James Joyce Street. Running here makes an interesting comparison with running around Richmond Cottages, which seem little changed from Joyce’s time. We walked along the North Strand Road till we came to the Vitriol Works and then turned to the right along the Wharf Road. Mahony began to play the Indian as soon as we were out of public sight. He chased a crowd of ragged girls, brandishing his unloaded catapult and, when two ragged boys began, out of chivalry, to fling stones at us, he proposed that we should charge them. I objected that the boys were too small and so we walked on, the ragged troop screaming after us Swaddlers! Swaddlers! thinking that we were Protestants because Mahony, who was dark complexioned, wore the silver badge of a cricket club in his cap. In An Encounter the boys head out the North Strand Road before turning right along the Wharf Road. The Wharf Road is now East Wall Road, and may have been that when the story was written. As the boys went down to the north quays they would have passed the train depot which became the Point Depot and then the O2. Directly across the river can be seen the spire of the church in Ringsend Village. The field overlooking the Dodder River was probably south of Fitzwilliam Quay. —Well, goodbye, old man. Must run in now. Awfully good to see you again—see any of the old Clongowes set, you know. Be good now: I must run. Goodbye. As he tucked up his soutane high and ran awkwardly up the drive [and] he « looked a strange, almost criminal, fugitive in the dreary dusk. » Stephen’s eyes followed the running figure for a moment: and as he passed through the door into the lamplit street he smiled at his own impulse of pity. It is interesting how easy it is to link routes with different parts of Joyce’s works. 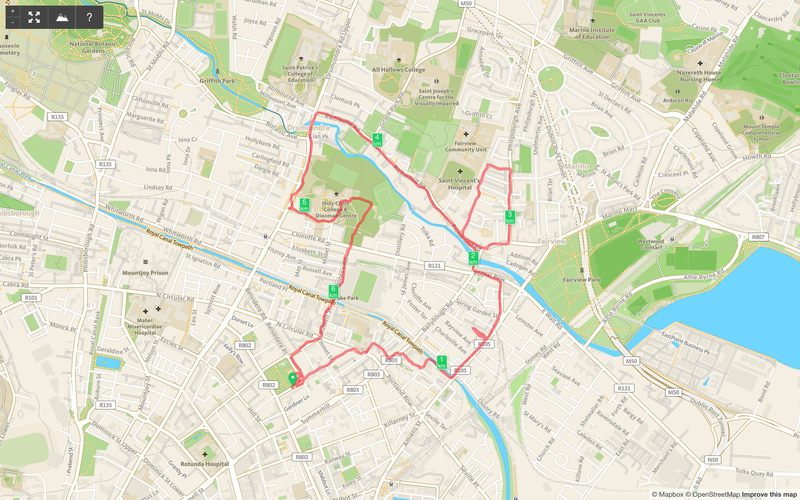 I went running down to North Richmond Street where Araby is set, then to Charleville Mall to see if it fits the scene in An Encounter (it does), then up Richmond Avenue where parts of The Portrait are set, through Philipsburgh Avenue where Joyce lived, around Richmond Road to Drumcondra and into Clonliffe College where part of Stephen Hero is set, back through Jones’s Road, the scene of the fight in The Portrait and back up Fitzgibbon Street where Joyce lived and Father Conmee wanted his letter posted in Ulysses..now where has the postbox gone? Joyce, J. (1963) Stephen Hero. Edited by John J. Slocum and Herbert Cahoon. Introduction by Theodore Spencer edn. New York, United States: New Directions Publishing.